1. When Last Did You Have Photographs Taken? Let's just clarify this ... a selfie taken with your fiancé is not a professional photo shoot :-) But joking aside, do you own at least 5 great photographs of you and your finance? When last did you really have your photograph taken? An engagement shoot will give you exactly this. But don't wait till the last minute before taking these photographs. As the wedding day comes near you'll find yourself too occupied with other things (including planning the actual wedding) that you won't find enough time for the shoot. 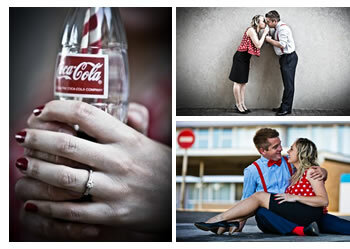 Make time and get your engagement photographs taken! Unlike wedding photographs, an engagement shoot allows the both of you to freak out, go crazy and get some superb photographs taken. An engagement shoot is actually just about the two of you. No one else. That's why you should freak out and do what comes naturally to you. Step 1: Pick a location. This can be a place where you first met, or perhaps you both of you would prefer a timeless nature photography shoot. As long as both parties are comfortable with the location. Step 2: Pick a theme. This can be anything from preparing food together in your kitchen, playing golf, or bringing along some props for the shoot. Step 3: Have fun with it. You will probably have 1-2 hours where you can do whatever you want. The photographer will make they capture the moments. The two of you should just have fun and enjoy every moment. Again, the engagement shoot is all about the couple. 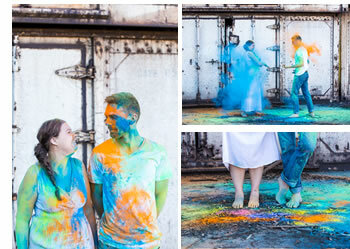 Oh please, pretty please, your engagement photographs aren't just meant to be uploaded to Facebook. These photographs can be used for so much more! Firstly, they can be used for sending out the 'Save The Date' or wedding invitations. Use it at the wedding for table indicators, guest books and even for a slide show during reception. And of course, you can print these! Nowadays people don't print photographs anymore, but do yourself a favor and print a canvas of one of your favourite photographs and hang it somewhere where your guests can see this. You will be amazed how stunning it looks! The big advantage of an engagement shoot is that both parties can get comfortable with one another. Some couples might be camera shy and the engagement shoot will help them to get more relaxed and natural in front of the camera, as well as with their photographer. 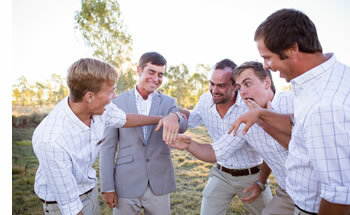 If the same photographer is hired for your wedding day you are in for a treat. Instead of having a photographer taking your photographs, you will have a 'friend' at your wedding taking your photographs. Professional photographers will take time to better understand their clients and what they love, their hobbies and interest. The engagement shoot will not only help you to be understand what the photographer wants from you (posing etc) but on your wedding day it will be breeze as both parties are familiar with one another and understand what each party wants.